Your kids just got out of school and it is already time for Back To School. It’s hard to get started, so I have created this series Quick Start Back to School to get everyone going! The next post is about Back To School healthy meals and snacks. 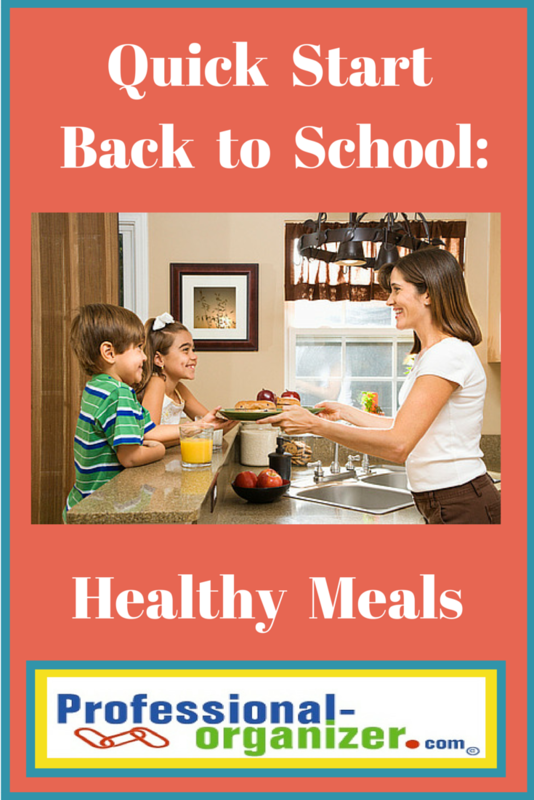 Back to school is the time healthy meals and snacks for our family are most important. We want everyone to feel energized and focused as they get back into the school groove. There are lots of glitches in getting healthy meals on the table, but streamlining and simplifying make dinner time easier. Often we get stuck at the first step – that being what to make! We feel overwhelmed by choices, by complicated recipes, too many different tastes in our family and by a lack of prep time. Poll your family first. They know what they like. No need to reinvent the wheel. Simplifying with consistency. Use lists. It’s easier than pulling ideas from your head. Post the list where you and your family can see it. The list can be a weekly, Monday – Friday list of dinner ideas. It can also be a list with days of the week assigned to a category, like Monday is breakfast for dinner, Tuesday is Italian night. It can also be a list of what’s already in your freezer, such as proteins and veggies. Allow for options for picky eaters. If one child only eats hot dogs, just keep a quantity on hand. Gather ideas by looking online at pinterest. It’s a fun way to try easy new recipes with lots of basic instruction. We never seem to have enough time. Planning in prep time and grocery shopping make it easier. Having a day of the week that is grocery day helps you save time and energy all week, rather than running out at the last minute for milk or eating out. Even if you shop twice a week, you are planning better! Include kids in prepping food. It’s more fun with everyone in the kitchen together. If your kids are younger, ask them to set the table or empty the silverware in the dishwasher. All kids love to help when food is around. Prep lunches the night before to avoid the morning scramble. It’s easy with lunch boxes ready to go. Have your kids help with this too. Work in bulk. When prepping for lunch, double up your recipe and bag it up. Set aside one shelf in your refrigerator for lunches. Over and over I see the value of family dinner. If your schedule does not permit it nightly, plan on one night a week. Your family fun quotient will go sky high! Not sure what to make for dinner? Ideas for dinner on my Dinner’s Ready pinterest board. Back to school for you too! Join my newsletter to get more ideas on organizing and productivity once a month. 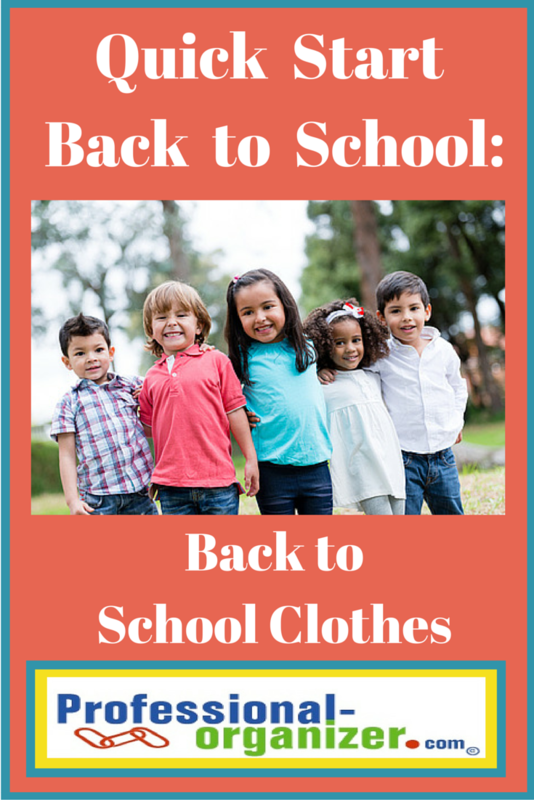 Your kids just got out of school and it is already time for Back To School. It’s hard to get started, so I have created this series Quick Start Back to School to get everyone going! The first post is about Back To School Supplies. Back to school and it’s all about back to school supplies! Every year your kids bring home unused school supplies at the end of the school year. The sales for supplies start in mid July. Maybe your supplies are in many different spots in your home. Quick Start Back to School by first organizing your school supplies. Choose a central location for office and back to school supplies. It should be easy to access for everyone. It should have shelves or drawers to help store different categories of supplies. It’s one stop shopping at your home this way. Gather and sort your supplies. Keep paper together, writing supplies together, notebooks and dividers together. Use plastic bins (shoe box and sweater box size) to corral each group. Overloaded with supplies? Donate to local charities having school supply drives. Label bins and place on shelves or in drawers. Label the outside of the storage area. Itemize your back to school supply needs. Find online resources for school supply lists on your district website. Compare your list with your existing supplies. Use a smart phone app to compare prices at stores. Set up your homework station. Consolidate remaining supplies in your new station. Check the ads and be prepared with your list! 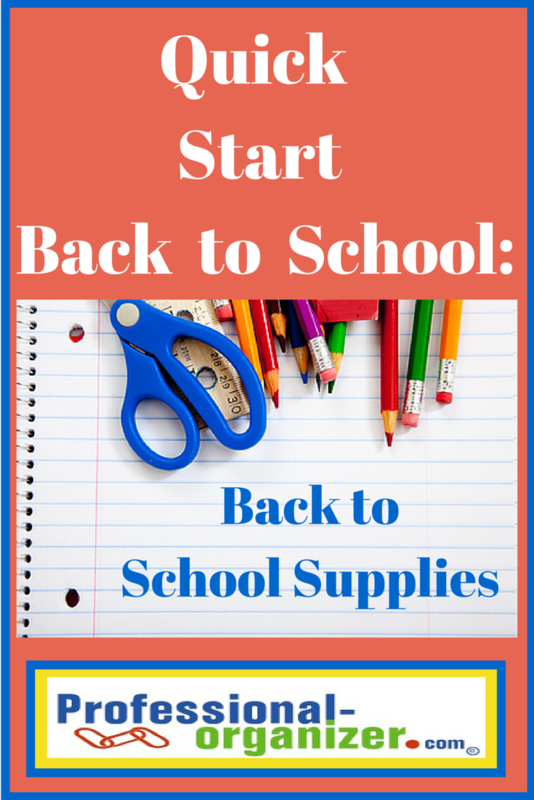 Quick Start School Supplies gets you up and running for this school year. What’s your best tip for school supply organizing? Check out my pinterest Student Success board. Organizing saves you time, money and energy! Join my monthly newsletter and get a boost! The start of a new school year can be empowering and difficult. It brings the promise of a new teacher and a fresh start, as well as the fear of previous challenges. For your ADHD family, back to school is a new beginning each and every year. 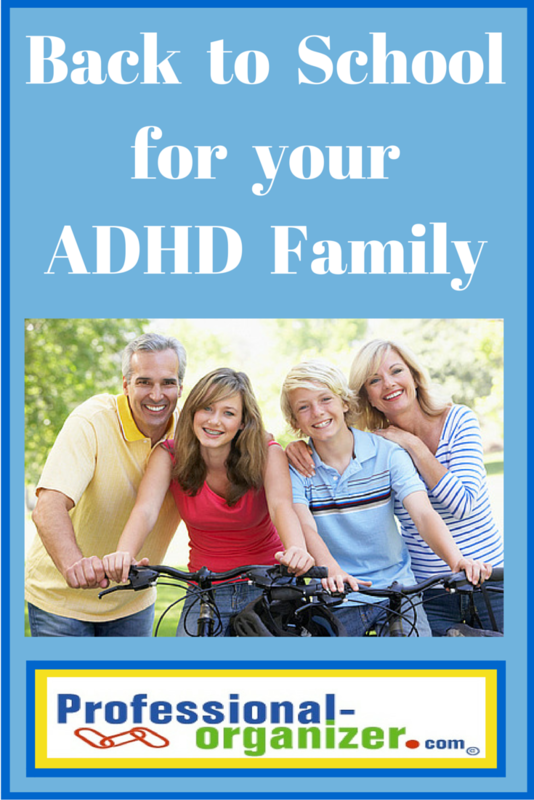 Back to school for your ADHD family is a great clean slate. It’s about starting off with fresh energy. There’s excitement in collaborating with a new teacher. Start your year off with a family meeting about the successes from last year. What worked well? What didn’t? Starting off with a successful, solutions oriented perspective will make this the best year for your family. There are many ways to set up binders and accordion files for your child. There are many different school supplies. Rely on your school district supply list and check your own supplies. Coach your child to set up a binder system and school supplies that work for him/her. A homework folder or pocket in the binder where all homework comes and returns makes it easy to keep up with this paper. The best systems are the most simple. One of the hardest parts of school is homework routines. It’s all about consistency. Set a time for homework to start and finish after school. Starting after a snack and short break makes it easier to complete homework. Set up a homework spot with an additional set of supplies for your child. Partner with your child to prioritize the daily assignments, working in small time slots. Using a timer can be a bonus for getting started and working without distractions. A critical element for all routines is good rest. Set bedtimes for parents and kids. Start early getting to bed, eliminating blue screens at least an hour before bedtime. Have a charging station in a public spot for all electronics in the home. A good night’s rest is a great way to be sure everyone is working at their full potential. Set up a landing strip where kids backpacks, your purse, and possibly shoes are housed. There’s no scrambling in the morning when there’s only one spot. Clean out backpacks and purses weekly. Parents, teachers and counselors working as a team is the best for everyone. If your child has a 504 plan or IEP, review that early in the year. Frequent communication by email helps everyone work together. Start the year off with an email to your child’s teachers sharing his/her strengths and noting where help is needed most. Establishing a trust relationship takes time, but working as a team is best for your child. Gathering a team of resources is an asset. Your child can benefit from work with a counselor, professional organizer or homework buddy. In having a team you can learn and share what works with each professional. Join my newsletter for a monthly dose of organizing tips, tricks and tools. Our smart phones and tablets can help us stay organized and be productive. Some of the best family apps help us do things from deposit a check to find out when a flight arrives. Many are free or cost a dollar or two. Taking advantage of an app to expedite a task, get a task done more easily or even make a task more fun is a reason to find your family’s best family apps. We all have our favorites for different reasons. Here are a few of mine by category. Please add your favorites below! For kids, I am a big believer in low level technology use. However, there are lots of awesome apps for learning too! 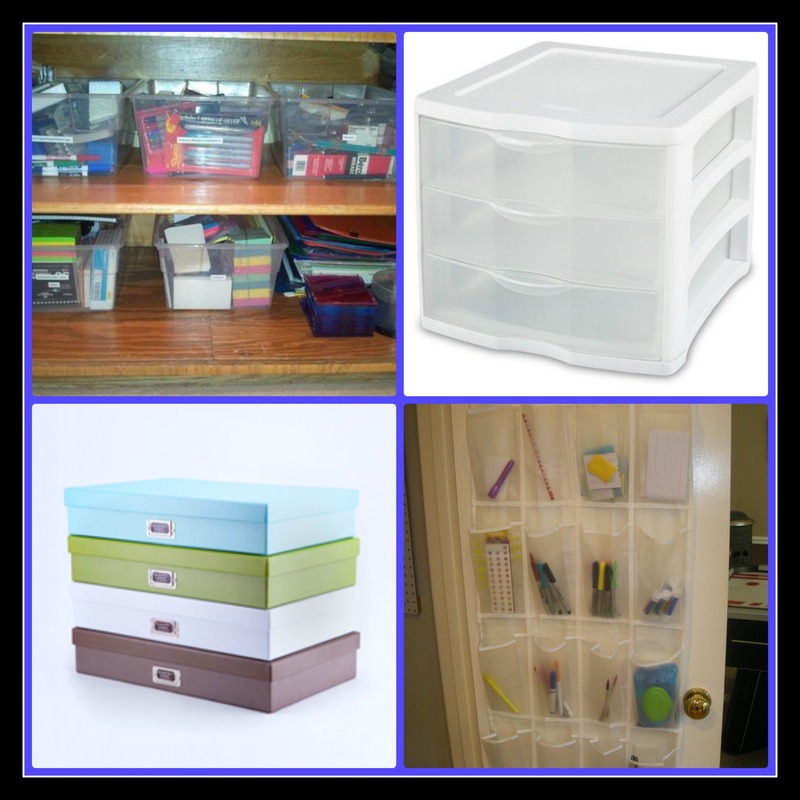 Join me on High Tech and Technically Organized for more tech organizing ideas. My newsletter arrives monthly with more insights into organizing. Join in the organizing fun! 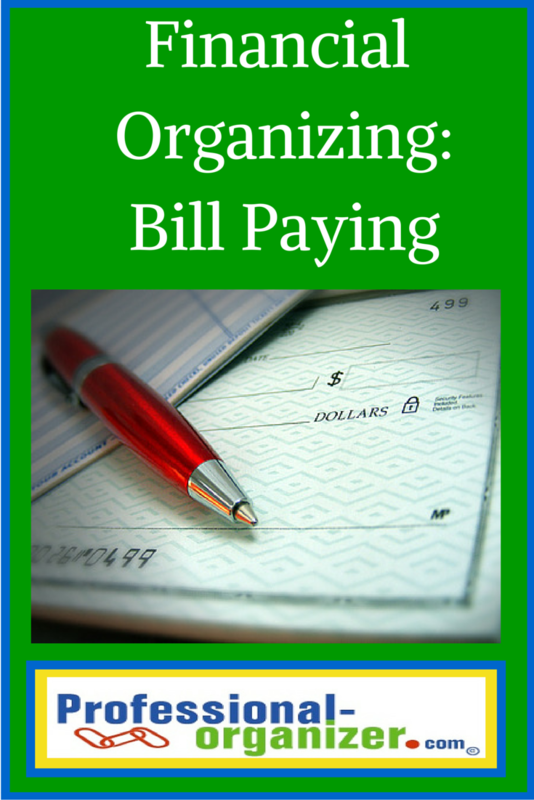 Good financial organizing requires being organized about paying bills. Bill paying is a necessary evil for us. It’s not fun! (It’s not fun ever!) Sometimes it’s scary because we may not have enough money to pay bills. Sometimes it’s complicated because income comes in at a different time than bills come in. Sometimes it’s just so much going on it’s hard to keep up with every thing. We try to find the easiest way to pay our bills on time. (Paying your bills on time increases your credit score, which is linked to credit extended by banks, mortgage companies and other loans.) There are lots of different ways to pay bills. Choose what’s best for you. Bill paying starts with a great system and routine. Think of bill paying as a process with steps. Follow these three steps and add in your own personal touches to make bill paying easier and less stressful. Gather the bills in your command center. I recommend getting the paper bills as a reminder you need to pay them. Bills can get “lost” in your email. Place them where you will see them, just so you remember to pay them. Keep a list of your bills so that you know what you pay and when you pay. If you pay everything online, this list is especially helpful to see. At times these systems can overlap, but generally find one that works best for you. Also have one as a back up, in case there’s an oops. Pay by check. Order 2 sets of checks at a time so you always have checks. Place the checks together with stamps, envelopes and pens. Pay online through your bank. Print out the consolidated receipt. Pay automatically with a bank account or credit card. Review your accounts monthly to be sure everything is paid correctly. Pay by phone. Create a list of account numbers and phone numbers for each account. A bill tracker ledger helps you remember when bills are due, the amounts and if you paid them. Our lives are busy! However, a routine is what keeps your bill paying from becoming chaotic and late. Choose just one routine and practice, practice, practice. Pay bills each day as arriving. Open the envelope and write the paid date on the bill. Pay bills weekly on a certain day each week. Consolidating bill paying saves time. Pay ahead double the amount. This can get tricky, so be sure you keep a list of how much you paid when. Set a weekly time to work on money. No matter which routine you choose, have a regular time to check your bank balance and credit card statements helps you adhere to your budget. Use an app for tracking your bills. This helps you keep your routine going. After you have completed bill paying, you can file all the bills in one box labelled with the year. 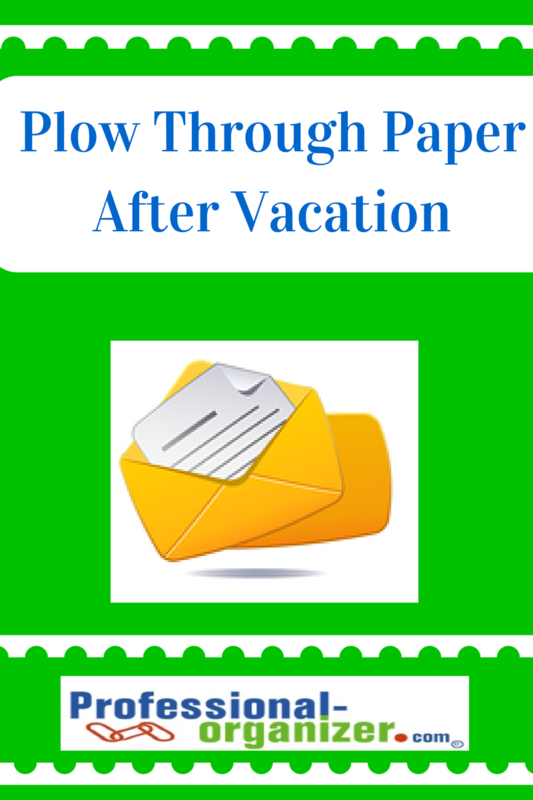 It’s the easiest, fastest way to keep up with these papers. The box can be in your office, easy to access. It’s just that simple! Have some tricks or tips to your bill paying? Join me on my Financial Organizing pinterest board. Don’t miss a minute of organizing or productivity fun! Join my newsletter. We all want to make the best use of our resources. Saving money is at the top of this list. Financial organizing creates a focus on your goals, your systems and your routines around money. 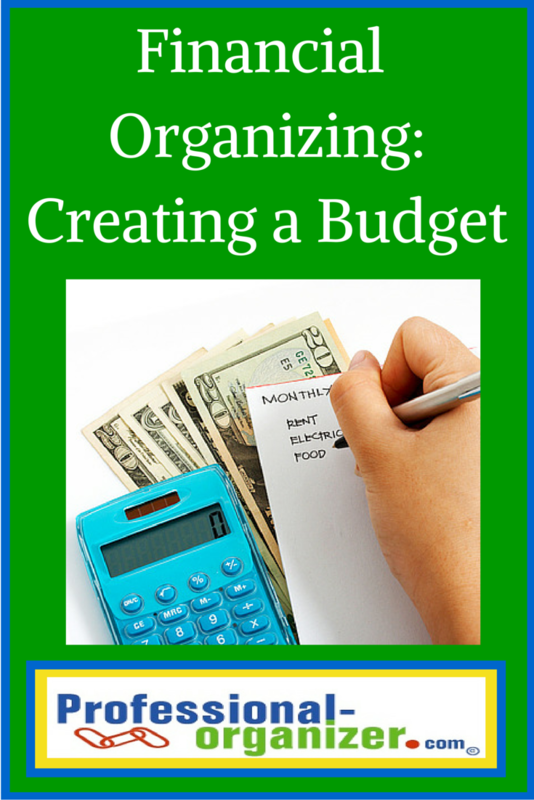 Creating a budget as the first step to organizing your money. Start your budget by knowing what weekly and monthly expenses you have. Start with a list of all the utilities, rent and bills you pay every month. These expenses are often set already. Use mint.com to see what categories you are spending money on each month on your credit and debit cards. These expenses can be modified to see where to save money. Use cash for 2 weeks. Go to the ATM, withdraw the amounts for each category, and pay with cash. Leave your credit cards at home. Need a spreadsheet or list to create categories? These templates can help. Once you know where your money is going, you can take the next step with clarity. Pay yourself first with automated savings. You can set up an automatic deduction from your checking account to a savings account. Decide on a percentage of saving or a dollar amount to have transferred each month. Think about your personal goals. Is it to retire comfortably? Take more vacations? Invest in more education for yourself? Link your goals to empower your savings. When you know what you are saving for and a timeline to accumulate an amount, it is powerful. Designate 2 or 3 ways you will save money. There are small ways to start saving money. Eat at home for dinner. Pack lunch for work and school. Grocery shop with a list on the same day each week. Starting small helps you accomplish your goal to save money. Get educated on the best ways to invest your savings. Learn from blogs, attended local seminars and find trusted investment counselors. If it’s all to easy to go online or use a credit card for purchases, use a strategy to defer purchases. When online shopping, use the wish list instead of the card. Return to the site a day later and decide if you want to make a purchase. Carry only your debit card with you to make purchases, rather than a credit card. Just like a diet, if you feel deprived you will not keep up with your budget. Keep sight of your goals with a picture of what you want to accomplish. Reward yourself with small purchases to keep on track if needed. A small splurge can be a good thing! Budgets help you accomplish your short and long term saving goals. Having basic tools to prioritize how you use your money makes it easier to accomplish these goals. Lots of ideas on money management and financial organizing are on my pinterest board. Keep up to date with the latest organizing and productivity news! Join my newsletter.